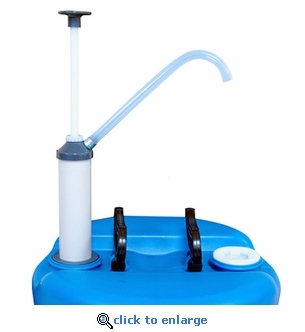 This emergency water siphon pump is what you need to pump water from emergency water storage barrels. Easy to use and adapts to fit 2" and 3/4" opening on all FDA approved water storage barrels. Designed for use with 5, 15, 30 or 55 gallon water storage barrels. Dispensing rates: 2, 4, 6 or 8 oz. per stroke. Adapts to 2" and 3/4" IPS national pipe thread openings. Includes 5 gallon pail adapter.